Whoa! 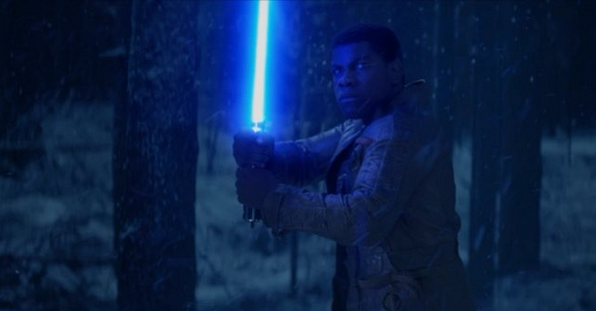 Finn Squares off Against Kylo Ren in New Instagram Video for ‘Star Wars: The Force Awakens’!!! Wowza. The official Star Wars Instagram account released a new video today giving us some new looks at The Force Awakens. Most notably, the image above of Finn (John Boyega) firing up a lightsaber as Kylo Ren approaches. I love seeing Boyega with that lightsaber in his hands! Today, Instagram announced that – in addition to square posts – you can now share photos and videos in both portrait and landscape orientation on their platform. With this update, Instagram users can upload widescreen video which will be more cinematic than ever. This morning, @StarWars released an exclusive look at their upcoming film, The Force Awakens, using Instagram’s new landscape orientation. As part of this collaboration, Star Wars: The Force Awakens is the very first video content to be showcased in this new format for the Instagram community. The film stars Harrison Ford, Mark Hamill, Carrie Fisher, Adam Driver, Daisy Ridley, John Boyega, Oscar Isaac, Lupita Nyong’o, Andy Serkis, Domhnall Gleeson, Anthony Daniels, Peter Mayhew and Max Von Sydow. Kathleen Kennedy, J.J. Abrams and Bryan Burk are producing with Tommy Harper and Jason McGatlin serving as executive producers. The screenplay is by J.J. Abrams & Lawrence Kasdan. “Star Wars: The Force Awakens” releases in U.S. theaters on December 18, 2015. This entry was posted in Breaking News, Film, Star Wars and tagged JJ Abrams, John Boyega, Star wars, Star Wars: The Force Awakens, The Force Awakens. Bookmark the permalink. A New Piece of Promo Art Shows Reveals Where the Lines are Drawn in ‘Captain America: Civil War’! Could Mads Mikkelson be Feeling (Doctor) Strange? Cameron Crowe to do a TV Comedy About Roadies!